Margot Aldrich's advanced studies were pursued at the Guildhall School of Music and Drama in London, England and at the Conservatoire du Québec à Montréal where she won a Premier Prix in the viola Concours. 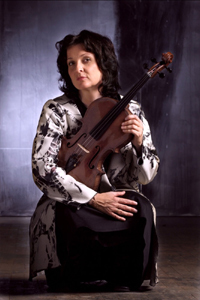 Margot has played regularly with l'Orchestre Symphonique de Montreal, l'Orchestre Métropolitain, I Musici de Montréal, The McGill Chamber Orchestra, l'Orchestre des Grands Ballets Canadiens, l'Opera de Montréal and Les Agréments Baroque Ensemble. She was violist of the Claudel String Quartet for two seasons before moving to Nova Scotia where she has been Assistant Principal Violist of Symphony Nova Scotia since1996, is violist of the Blue Engine String Quartet and has performed and recorded with many Nova Scotian groups and artists such as Tempest Baroque Ensemble, Walter Delahunt, Denise Djokic, Sanctuary, Janice Jackson, MIR, Mary Jane Lamond, Gordie Sampson, as well as with outside artists such as Scott St. John, Mark Fewer, Desmond Hoebig, K-Os, Kanye West, Kim Stockwood, Sarah Brightman and others. Margot has taught at le Conservatoire du Quebec, CAMMAC music camp, NSYO, Acadia University and the Maritime Conservatory of the Performing Arts. Margot lives in Halifax with her film-maker husband and their three children.